Duplicated discs are made with recordable media like CD-R and DVD-R. Replicated discs are made using injection molding technology and when done become CD or DVD ROMs (read only memory). As a general rule jobs with quantities of 1000 or more use replication and quantities below that use duplication. This is the original way that Phillips invented optical laser technology in the 70's. In simple terms the data is defined on a ROM disc by creating pits whose height differences are read as either zeroes or ones. How does recordable media work? In the 80's Taiyo Yuden invented the recordable media process. Through the use of special dyes the "pits" created in the ROM process are simulated on recordable media. Which Print process is best for me? Monocolor black thermal is the least expensive of all. Thermal does a great job with text and very simple line art. The printed disc has excellent durability qualities. This style of printing is done with a Rimage Prism printer at CD-Lab. Inkjet is the least expensive of the color processes. Both the hardware and the consumables are generally less expensive with this method.. The disc surfaces have a matte style finish and are not considered durable. Inkjet printing will fade in time and is also "smear able". A simple solution to this issue is the use of Water Shield media. This greatly increases the durability and also makes the printed image glossy. 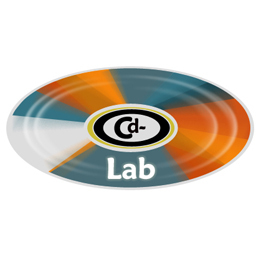 Inkjet printing at CD-Lab is done with aMicroboards Print Factory Pro. Thermal re-transfer yields the best quality for short run jobs requiring color printing. Although somewhat expensive this process yields a glossy and indelible print. This style of printing at CD-Lab is done with a Rimage Everest printer. Screen printing is commonly used in the replication process. This can either be a full color process using CMYK standards or is sometimes used when exact colors need to be matched. Specific Pantone colors can be applied when for instance a company logo has be an exact color. Offset printing is the latecomer in the disc printing world and also used mainly in the replication process. This method creates discs with excellent resolution, good color matching and overall great results. Is there a difference between different recordable medias? The main difference between professional grade media made by both MAM-A or Taiyo Yuden and the retail media sold through office supply stores is production controls and licensing. Large distributors of CD and DVD media purchase their discs from the lowest bidder on the world commodity market. Most of these discs are made in Asia by factories that don't always comply with ISO standards and sometimes don't pay royalty fees. For the common home user making a handful of discs this probably won't be a problem. For business' creating larger quantities it is a matter of "if and not when" disc failures will occur. Also be aware that even Taiyo Yuden sells "B" grade media that did not pass their normal standards. Be sure to know your retailer well so you don't end us with these discs unknowingly. How do I use the Color Template? Open the template in a graphics program that can handle layers like Photoshop, Illustrator, InDesign or others. Need Help? Call (866) 300-3408 and an experienced staff member will be happy to help. Yes, we are currently using Dropbox for this. Please contact us for details.